A few weeks ago I wrote about the unexpected joys of the Netherlands, things that I hadn’t known anything about prior to moving here but the existence of which has been a wonderful surprise. A major feature of that post was the show Boer zoekt vrouw, for which my love is unbounded. I never believed I would find another show which could compete for my televisual affections, but I didn’t count on Ik hou van Holland (I love Holland). Oh, this show should be a disaster. In theory, there are only two ways it should go: it should either feel like a nationalist rally, or degenerate into a cynical celebration of the worst features of the country. But the Dutch have done it again; taken a recipe for disaster, added a dash of charm, a sprinkle of innocent humour and a huge dollop of fun, and created a masterpiece. The programme has more than 2 million viewers, making it by far the most popular Saturday night viewing in the Netherlands. Watch the video below of the intro to the programme; everyone gives it their all against a backdrop of cheese, cows, and other wonderfully stereotypical symbols of Dutchness. That’s Queen Beatrix being interviewed at the beginning of the video by the way, she really loves Holland. You just know that after an opening like that, the rest of the show is going to be glorious, and it doesn’t disappoint. Two teams made up of famous Dutch people are tested on their knowledge of the Netherlands. They are led by Guus Meeuwis, a Dutch singer-songwriter, and Jeroen van Koningsbrugge, a Dutch actor, presenter and comedian. To distinguish between the teams, a lovely touch is the tulip brooches all the celebrities wear; red, white and blue blooms (colours of the Dutch flag) for one team, orange (the national colour) for the other. The poor audience don’t escape with such sedate identification. The half seated behind Jeroen is dressed entirely in red, white and blue, with matching scarves and face paint, while the half seated behind Guus is submitted to the same treatment in orange. The celebrity teams, cheered on by the audience, compete against each other in several rounds. 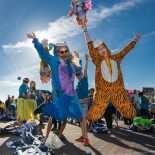 For the most part the activities are harmless, essentially a mash up of Family Fortunes, The Generation Game and Countdown with a Nederlandse twist. There is for example the round Wie is de bekende nederlander? (Who is the famous Dutchman? ), in which contestants are given photos of Dutch celebrities at 5 years old and have to guess who they have grown up to become. Or Linda’s Supermarkt, in which the presenter is at a checkout with 24 items and the teams have to remember as many of those items as possible. There are maths puzzles, anagrams, Chinese whispers, geography tests, all with the Netherlands as their subject of interest. So far so standard game show format. However, a distinctly questionable round is Mr. Cheung Hoi Chi. The premise is that a Chinese man with very limited Dutch skills sings a heavily accented version of a famous Dutch song, and the first team to correctly guess what he is singing wins the round. Yes, really. Like the Zwarte Pieten, things happen in the Netherlands which we are just too politically correct to permit elsewhere. In the final round, teams have to answer general knowledge questions. 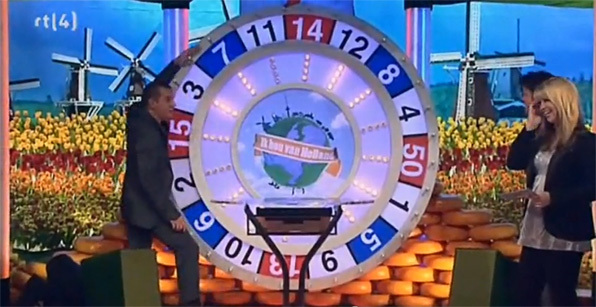 If they answer correctly, the team captain gets a spin on the wheel of fortune which can garner them anywhere from 0 to 100 points or, if the spinner is particularly unlucky, they can land on the alles kwijt segment, which strips them of all their hard-won points. You can feel nervous anticipation emanating from households across Holland as anxious families wait to see where the wheel will stop. At the end of the show, in a delightfully wholesome twist, the audience members who were supporting the winning team are all given something to eat as a reward. In the last episode I watched, everyone got a big slice of apple pie with cream. I hope they gave poor Mr. Cheung a piece too, for being such a good sport. Ah, Ik hou van Holland. I really do. This entry was posted on November 28, 2012 by admin@theleidener in Culture, Robyn and tagged game show, Ik hou van Holland, International, leiden, national pride, Stereotypes, Student, TV.